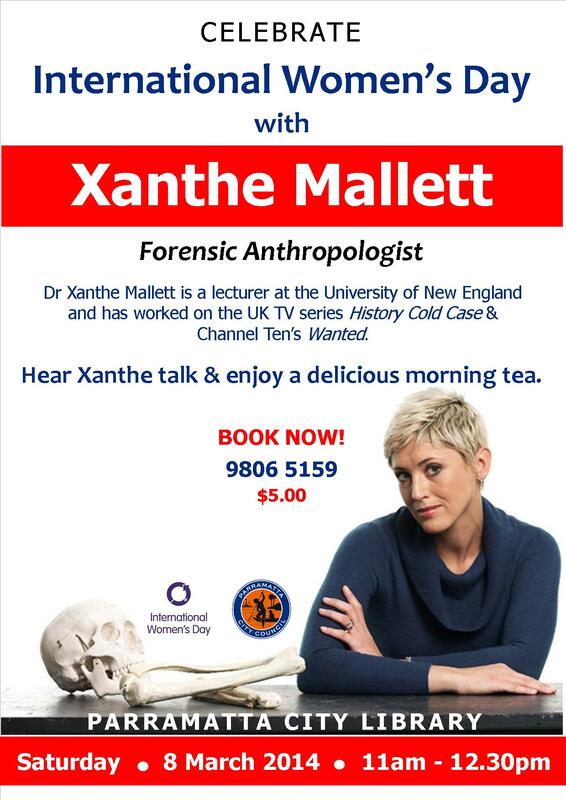 In celebrating International Women’s Day Parramatta City Library has invited Dr Xanthe Mallett, a forensic Anthropologist, coming to meet us all in Parramatta Library. Dr Mallett worked on UK hit TV series History cold case & Australian TV series Wanted. She also developed her skills to criminology as she was becoming more interested in investigating the behaviours behind the crimes, rather than identifying the victims and offenders from physical evidence they leave behind. As a result, Dr Mallett decided to move from forensic science into criminology. When her career developed, Dr Mallett felt criminology is more developed in Australia than the UK, so she has moved to downunder and has become a senior lecturer at University of New England. As a high achiever Dr Mallett will talk about her career development as well as the importance of education in women’s life. Come and join us to have a nice cup of coffee/tea with Dr Mallett, at 11 am, 8th March, at Parramatta Library. This entry was posted in Australian Authors and tagged International Women's Day 2014, Parramatta City Library, Xanthe Mallett by admin. Bookmark the permalink.